With experienced florists working to bring you the most beautiful in contemporary floral design, you will wonder why you ever used another service. We bring flowers to the public 24/7 at our Marylebone shop and can delivery nationally and internationally – saving you valuable time to get on with your day. Always associated with weddings and the arrival of new things, white flowers are perhaps not considered highly enough alongside other colours and have sometimes be undervalued. However, the variations and variety found in white is truly astonishing and the crystal clarity, elegance and sophistication of callar lilies, white roses, gerberas, daisies and hydrangeas are unparalleled. The simplicity and delicate nature of white flowers makes them well suited for relatives or more formal occasions, with the daffodil a firm English favorite over the centuries while delphiniums can add a touch of the theatrical to any bouquet. During the spring and early summer months, the white peony is an eye catching flower adored by many for its huge head and dramatic white petals. 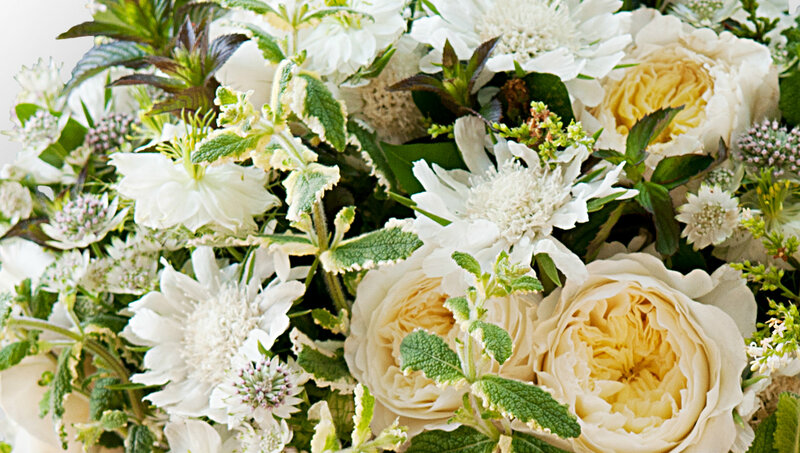 Ideas of purity and clarity are commonly associated with white flowers and they can work alone as a stunning, brilliant bouquet or work as a base and compliment to more vibrant compositions. Order before 6pm and we will ensure your chosen bouquet arrives at its destination the very same day within London. We also offer 3 hour delivery for urgent bouquets that simply cannot wait while we also provide next day delivery for postcodes outside London. All flowers are carefully packaged and handled with the upmost care to guarantee your flowers arrive in beautiful condition ready for any occasion. We are open 24/7 and our dedicated florists work round the clock to make sure the deliveries can always be made on time using only the freshest flowers available. We also use a sophisticated tracking system that is available to customers in order to track your flowers as they leave the shop in real time, allowing satisfaction and confidence in our delivery process. White bouquets effortlessly communicate sophistication and a solid, seasonal white arrangement can really stand out from a crowd. Q. Will my flowers arrive in good condition? A. We carefully package and secure all deliveries to ensure the delicate petals and stems are not damged in transit. Q. Will my flowers be fresh when they arrive? A. We receive deliveries round the clock from Holland and beyond at our depot and all florists have access to the very best and freshest flowers. If the flowers are not fresh we will not use them. All flowers that reach you are as fresh as it is possible to be. delighted with the arrangement, could not have asked for more. Needed a bouquet asap and the order process was easy. Staff were helpful and my flowers arrived within the 3 hours. surprised by the quality and efficiency. Wanted flowers for my Mums birthday but was not sure what to get, they helped me decide and Mum was really happy. Recommend.